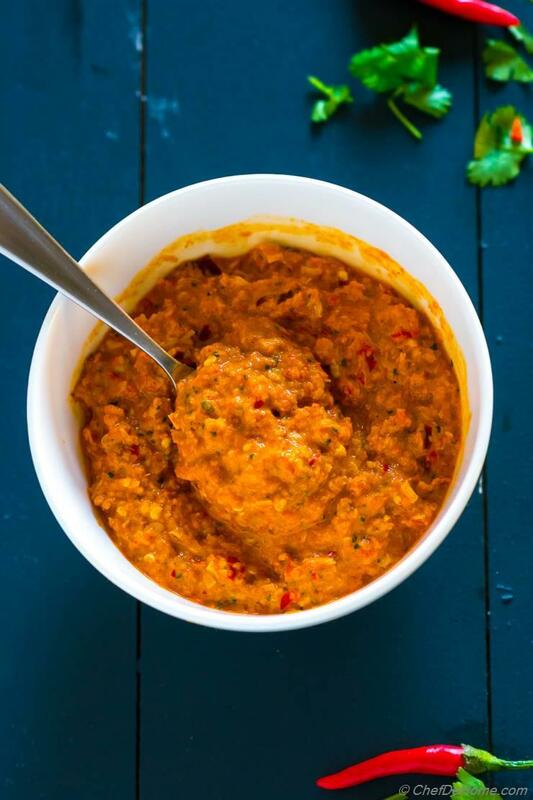 Homemade Red Curry Paste, a flavorful paste made of red chilies, aromatics, and easy to find spices. Ready in just 5 minutes, this gluten free and vegan paste is perfect to serve homemade coconut curry under 15 minutes. 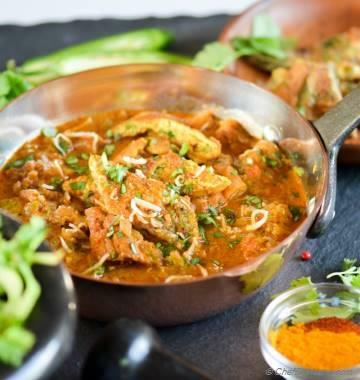 Invest 5 minutes over the weekend, then enjoy Thai style delicious curry for dinner, any day of the week. I'm including bonus recipe to make world's easiest Coconut Curry using this homemade Red Curry Paste. This post is part of "Use Your Food Processor" series. Earlier we made Instant Mashed Cauliflower using our trusty food processor. Curry pastes are my favorite to make in food processor. Process takes just a minute and consistency is always perfect for homemade curry. I make one batch over weekend and we get to enjoy homemade Curry few times that week.. When I shared my earlier Thai Red Curry recipe... Everyone said, this curry is spicy. Well, that was the intent. We eat spiced food and this is how I order it in Thai Restaurants. But I get it. 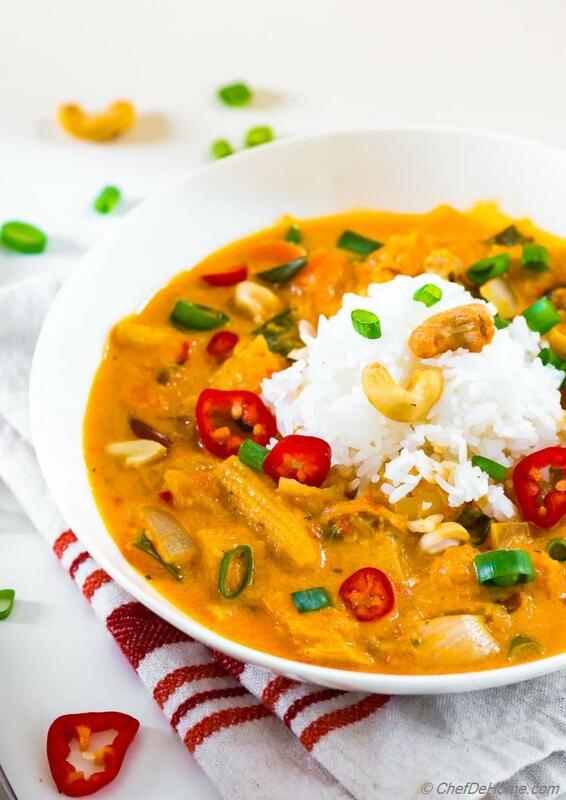 The most loved Thai Red Curry has that silky smooth savory coconut flavor with just a touch of heat and aromatic sweetness of coconut milk. So, today I'm sharing balanced spiced aromatic Red Curry Paste and silky savory (not that spicy) Coconut Curry. 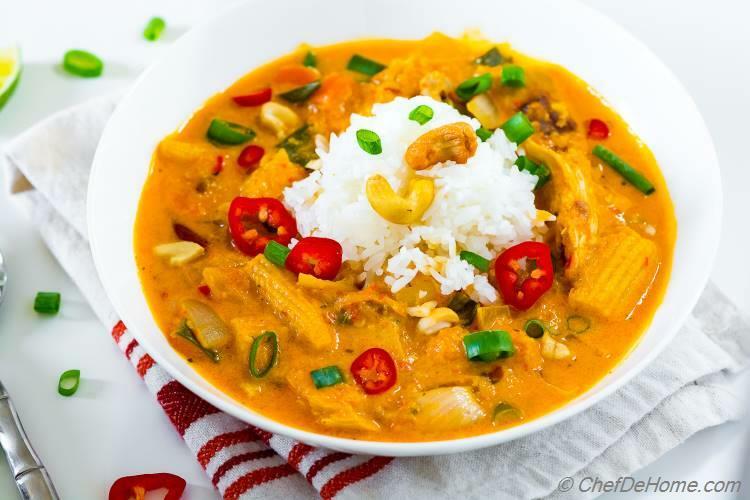 One thing is certain, if you always end-up ordering Thai Red Curry in restaurants, then this recipe will make you very happy. I'm covering all complains today. This version of curry paste has everything in one paste (no special blend of spices needed). 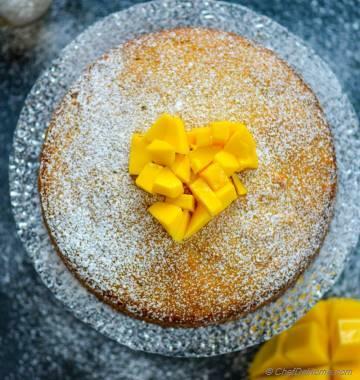 Plus the coconut curry has sweet, lemony and coconut notes that everyone can enjoy. 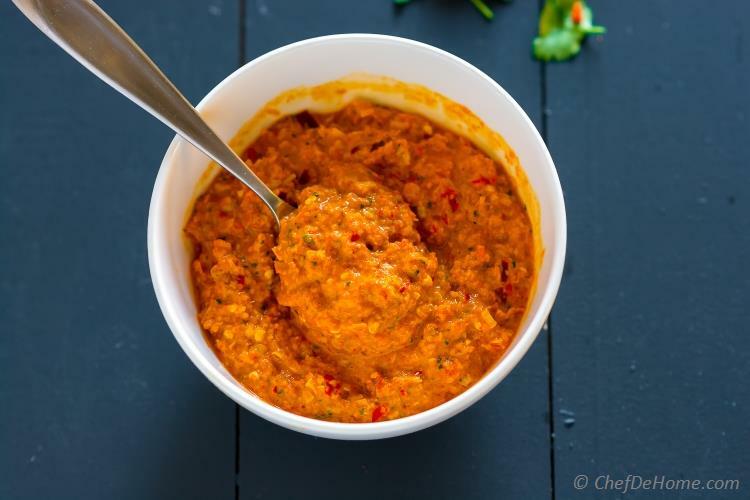 Homemade or Store Bought Red Curry Paste? If you ask me, I prefer the homemade version. It is way more fresh and delicious. Plus also has good shelf life. Specially the way I prepare it, it stays good in refrigerator for 2 weeks. I blend sauce in olive oil and also add some lime juice. These two work as natural preservatives giving longer shelf-life two homamde curry paste. Honestly, Thai red curry paste recipe is as easy as 1-2-3. 1) Pick all ingredients, 2) put in food processor and 3) pulse. That was easy! Right? The main ingredients for Red Curry Paste are - chilies, lemongrass, ginger and shallots. In traditional preparation, galangal (young ginger) is used which is less fibrous and has mild flavor. I often use whatever I have in refrigerator. When using regular ginger, I add little less and small chop it before adding to food processor. It will works out perfectly fine. Lemongrass is one important ingredient of Thai Red Curry Paste but if you can't find.. It is not a show stopper. Instead of lemongrass, increase the amount of lime zest and juice quantity mentioned in the recipe. Remember, lime is a good flavor substituent for lemongrass in most curry recipes. Oh, if you are making special trip to Asian store for lemongrass? I recommend buying a big batch. The softer yellow part of lemongrass can be chopped/processed then frozen to use later. Harder outer stems also freeze well and add delicious flavor to soups. 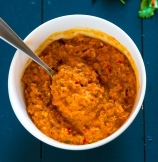 Red curry paste is the quintessential ingredient in Red Coconut Curry Sauce. In Thai restaurant-style preparation, curry paste is simmered with coconut milk and stock. Then, mixed in with sauted vegetables, cooked protein, rice or noodles. A hint of fish sauce (optional), and lemon juice. In 10 minutes, a rock-star coconut curry is ready to serve. When in just 5 minutes kitchen is filled with Thai Restaurant perfume.. You can tell recipe is headed in right direction. All it costs is 8-10 fresh ingredients and a food processor. If you like to ton your muscles and get in shape for New Year? Feel free to use Mortar-pestle. No kidding, this is how red curry paste prepared traditional way in most Thai households. Otherwise, invest in a good food processor. (affiliate link) I own a mini food processor. It takes less space, is dishwasher safe and perfect to make sauces, and pastes. How to use Red Curry Paste? 1) Add it to soups. 2) Add in Lentil Curries. 3) Add to Noodles Bowls. I hope you will get chance to make some soon. PS: I'm obsessed with Thai curry these days. Bringing more Curry Love your way. Do check back. Total Time 25 minutes Prep Time 10 minutes Cook Time 15 minutes Difficulty Easy Yields 1/2 Cup Curry Paste Serves 4 Notes Red Curry Paste is good to make curry for 4, twice. 1. To make Red Curry Paste, soak dried chilies in hot water for 10 minutes. Skin of chilies should be very soft. Take out and rough chop. Also rough chop rest of ingredients. Fine chop cilantro stem as these don't puree easily. If you can' find Thai dry chilies. 1 ancho chili (seeds removed) and 3-4 regular whole dried chilies (seeds shaken off before soaking) will work best. 2. 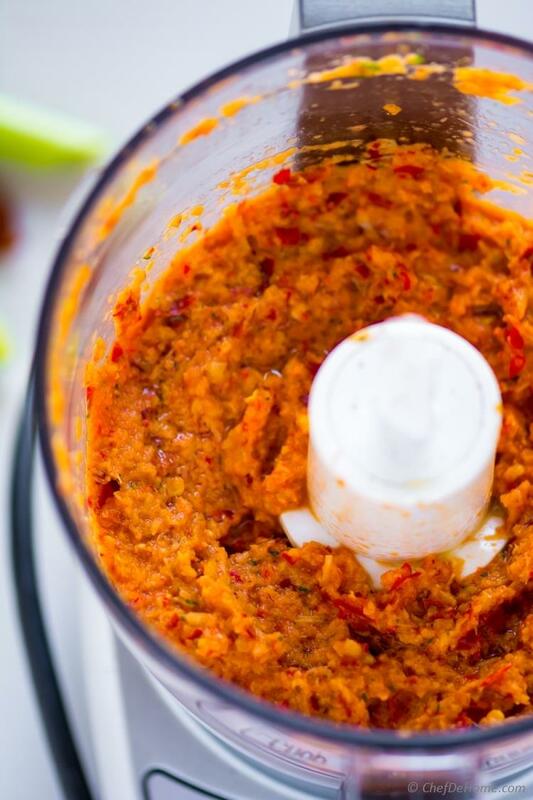 Add all ingredients for red curry paste into food processor jar with 2 tbsp of chili soaking liquid, 2 tablespoon of olive oil and a tablespoon of lime juice. Pulse until smooth. Add 1/2 to 1 tbsp more oil to facilitate puree of ingredients. Once smooth paste forms, remove in a bowl. If you can't find fresh Thai chilies, 2-3 fresno (seed removed) gives nice red color to sauce. Add 1/4 tsp paprika (not-smoked) for color. 3. To make coconut curry, heat oil in a deep saute pan. Add ginger and garlic. Saute for 30 seconds. Add in vegetables and stir-fry for 1 minute. If you prefer crunchy vegetables in curry. Take these out before adding coconut milk in next step. 4. Add 3-4 tablespoon of red curry paste. Follow by coconut milk, stock, and grated bouillon. Bring to boil, then simmer until sauce thickens. Taste and adjust salt, sugar, lime juice. 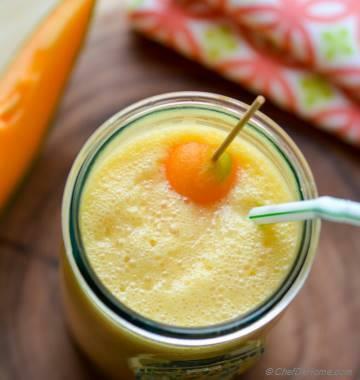 Mix in veggies. Serve with rice or noodles. Enjoy!